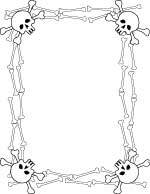 Pirate clip art borders - Jolly Roger skulls and crossed bones graphic dividers to use for pirate paper crafts, web page design, scrapbooks and desktop publishing. Click small images to enlarge skull borders. You might also like this skull and bones border paper!